Corrine Lea of the Rio Theatre just released to the media the exciting news of our collaboration with the Save The Rio campaign! Thanks to this agreement, the Hollywood Arts Foundation will provide tax receipts for larger donations to the campaign to buy the Rio Theatre and save it forever for the community. Donate to the Save the Rio campaign here. “When we first began our campaign to buy the Rio Theatre to save it from being torn down, we formed the Vancouver Art House Society – a registered non-profit BC society created to help buy the property with funds donated by the community to allow the Society to own shares of the property. With a mandate to help save arts and culture spaces, the Vancouver Art House Society is run by a board of industry professionals. Not only will the Society help save the Rio, but it will continue on as a legacy project to help other Vancouver arts and culture organizations in the future. It turns out that the Hollywood Arts Foundation also shares our same goal, to help save arts and culture venues in Vancouver. So we have decided to join forces! Not only will we be stronger together but one of the other major benefits this merge can offer is a tax receipt for all donations made to the public Foundation and in return the Hollywood Arts Foundation will also become a shareholder in the property, just like the Vancouver Art House Society. Attend the Open House this Thursday! Join our efforts to save the Hollywood in coming to the Open House on Thursday, March 15th between 4:30 and 7:30 pm at St James Community Square. You may have seen media reports of the proposed new development plan for the Hollywood Theatre. In broad terms, the proposal would see the City allow higher density development on adjacent properties in return for heritage designation of the Hollywood Theatre. The Coalition is generally in support of this approach, but we are continuing to look for details regarding the balance between the extent of bonus density and resulting public benefits. Although the City’s rejection of a similar redevelopment proposal in 2016, suggested that the City was seeking to acquire the theater in exchange for bonus density, the present proposal would see the Hollywood’s current owner retain the theatre and operate it as a for-profit entertainment venue, bringing live music, theatre, comedy, film festivals, TED talks, etc. to local audiences. While the proposed mix of programming sounds familiar and encouraging, what seems to be missing is a clear commitment to cinema as a key component. So, while we agree that the Hollywwod needs to become more than a movie theatre, we also feel strongly that cinema is an essential part of the Hollywood’s heritage and should remain a prominent part of its future, both through regular cinema programming and festival use. Another vital piece of the puzzle, from the Coalition’s perspective, is the Community Use Agreement between the City and the owner. Our understanding is that the agreement will establish guidelines for theatre use, including operating model and the extent of non-profit/community use. We also understand that the agreement will respond to public feedback received through the upcoming Open House. And, so, we encourage supporters to advocate for a strong and enforceable agreement that guarantees a healthy balance of programming, including regular cinema screenings and a generous commitment to prime-time non-profit use. And, obviously, a final consideration is the design of the new adjacent building and how it will relate to the Hollywood’s heritage and the rest of the street. 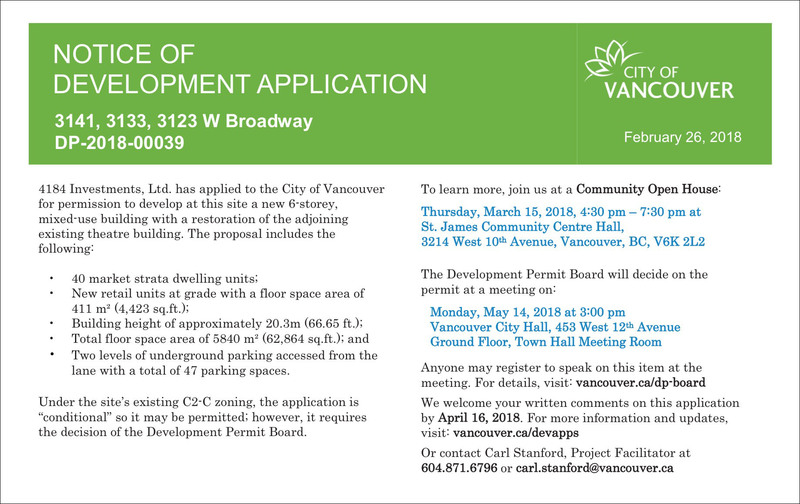 The entire development application can be viewed here. We encourage everyone who is concerned about the future of the Hollywood, and of the character of West Broadway, to attend the Open House and provide feedback to the City. In the meantime, the Coalition is requesting a meeting with the City to address foregoing issues and will continue to provide updates on our website and Facebook page to help keep the community informed – and help to ensure the Hollywood’s brightest future is realized. The Hollywood from Albert Kurian on Vimeo. The Save the Hollywood Theatre Coalition has recently reached out to the West Broadway business community to establish the extent of support for our plan to Reinvent the Hollywood as a landmark public arts and culture venue. Not surprisingly, the response has been enthusiastic – to say the least – with nearly 125 businesses (and more to come) signing our letter to City’s Managing Director of Cultural Services, Richard Neuwirth. 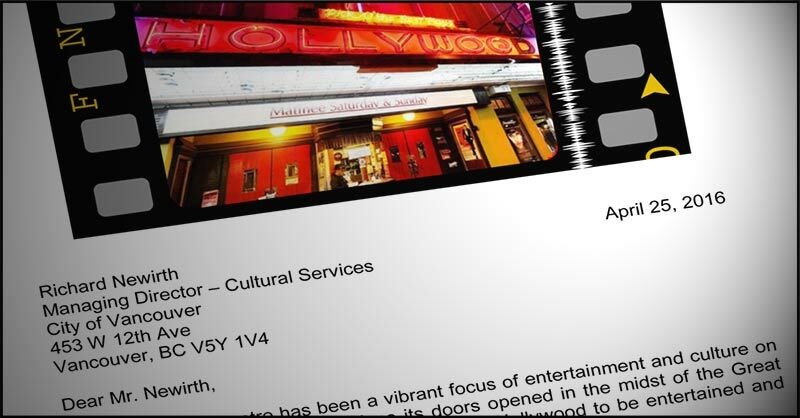 The letter recognizes the Hollywood’s unique value as a landmark focus of arts and entertainment on West Broadway and an essential contributor to the local economy. The Coalition is very pleased to acknowledge the strong support of following businesses (with more to come) and encourage our broader community of supporters to return the favour! Just like the Hollywood, local businesses are a key ingredient of a vibrant and thriving community. Fresh is Best Salsa Co.